Normally a rest day, 2016’s third Monday will in fact be another day in the saddle which exceeds 200km, as the peloton slink their way across France and into the day’s finish at the Swiss city of Berne. Yesterday’s immense amount of climbing saw an explosive race in the breakaway, but the high temperatures and ever increasing gradients nullified the anticipated attacks within the general classification favourites, but many of today’s contenders are bound to have suffered regardless. 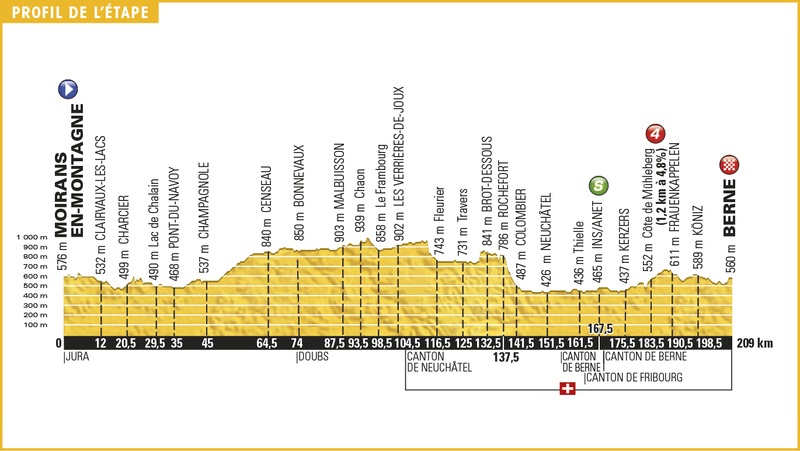 Stage 16 throws down a 209km route from Moirans-en-Montagne to Berne, a rolling day which the sprinters’ teams know could be the penultimate bunch kick before Paris, assuming they get their calculations correct to prevent a late move going clear. Peter Sagan makes everything look so easy, chewing up the road and spitting it out with the comfort of a man en route to the café for a Sunday’s worth of coffee and cake. Today has a very Sagan feel to it, the opportunity for long breakaways, late solo moves and uphill sprints over pavé should definitely lure the reigning World Champion to the fore as the final decisive moments approach. The actual impetus for him to perform may in fact stem from the fight for the green jersey with Mark Cavendish, as Sagan knows that a hard ridden race here could blow the Manxman out the back door and thus extend his lead in the competition with a potential victory. Bryan Coquard has established a growing reputation for dominating this type of finale and has shown form in this race deserving of a stage win already. The French are still without a win at 2016’s Tour de France and are running out of opportunities to remedy this fact, thus Coquard’s French team Direct Énergie will be extremely motivated to help him onwards to Stage 16 glory. Alexander Kristoff was not far off taking the win on Stage 14 when chasing home Mark Cavendish to finish second and now looks confident as the race enters its final week. Given the accumulative fatigue by this point of the race, Kristoff begins to emerge as a greater threat to the ambitions of his rivals here, the Norwegian often one of the strongest men remaining towards the end of a grand tour. Katusha seem certain to boss the front of the peloton, attempting to prevent any breakaways going clear and deciding the outcome before Kristoff even catches sight of the line. Michael Matthews should feel somewhat more relaxed as a result of taking the win on Stage 10 last week and will be a danger today yet again. The race should be ridden hard late on as the likes of Katusha and Tinkoff attempt to limit the odds of a breakaway making it to the line and similarly aim to knacker sprinters such as Mark Cavendish and Marcel Kittel before they reach the finish. The terrain should be of no great concern for the Australian, while his climbing prowess marks him out as one of those most likely to have recovered from yesterday’s mountainous efforts. Edvald Boasson Hagen provides a great alternative to Mark Cavendish on Stage 16, the powerful Norwegian picking up several similar victories earlier this season. With a mixture of pavé and uphill drags in the final kilometres, EBH will be open to joining any potential late moves, as much as he will hope for a reduced bunch sprint to decide the day. Marcel Kittel, André Greipel and Mark Cavendish are the purer sprinters who may struggle to remain at the front of affairs as the race enters its final moments in Berne. Kittel has recorded wins on far harder finishes than this, Greipel is the most consistent on similar terrain and Cavendish’s form right now gives the impression that anything is possible. For late breakaway candidates, Greg Van Avermaet, Jasper Stuyven, Fabian Cancellara, Jan Bakelants and Sep Vanmarcke all fit the bill. Posted on July 17, 2016 July 23, 2016 by Spokenforks	This entry was posted in Le Tour de France, Le Tour de France 2016, News and tagged Alexander Kristoff, Andre Greipel, Bryan Coquard, Edvald Boasson Hagen, Fabian Cancellara, Greg Van Avermaet, Jan Bakelants, Jasper Stuyven, Le Tour de France Preview, Le Tour de France Stage 16 Preview, Marcel Kittel, Mark Cavendish, Michael Matthews, Peter Sagan, Sep Vanmarcke. Bookmark the permalink.